One of the most basic ways to conserve energy is to extend the useful service life of valuable assets. It is not necessary to look farther than the energy industry itself to find millions of euro’s worth of key assets that are in use, on standby, or temporarily in storage until a brighter day on the market. In the manufacturing industry, conservation of materials, time, and labor is perhaps no less important to successful business. Finding the most efficient, cost-effective, and (where possible) environmentally friendly way to preserve goods and assets is an important key to maximizing ROI in both sectors. Corrosion is a major enemy of energy industry assets. This can be true whether the situation is a new power plant under construction, a refinery in operation, or a drilling rig that needs to be mothballed. In each case, the loss from rusted assets sitting unused for long periods of time can be drastic. This is not only in terms of the parts’ monetary value, but also in terms of lost downtime if, for example, a spare part is suddenly needed and found to be too rusty to install and use safely. In the manufacturing sector, freshly machined metal surfaces are particularly susceptible to corrosion, and production is often interrupted by multiple steps of cleaning and rust prevention. During shipment, metal parts are subject to uncontrolled environments where high humidity or temperature changes may cause condensation inside the packaging, leaving a corroded surface for the customer to unhappily discover. Traditional methods for preserving large assets in the energy industry can be hazardous or time, labor, and energy intensive. For example, nitrogen purging is an effective but dangerous way to protect large void spaces from corrosion by essentially removing all oxygen. However, a leak can be life-threatening to unwary personnel entering the space; it will also require nitrogen reapplication. Dehumidification systems discourage corrosion by removing moisture from the air, requiring a constant source of electricity to maintain a dry environment. Both nitrogen and dry air systems can be expensive to install and maintain. Major energy companies around the globe are taking more and more advantage of the energy, environmental, and practical advantages of Vapor Corrosion Inhibitor (VCI) technology for asset preservation. The fogging of a waterborne VCI material into a void space (e.g., large equipment interiors and piping) can completely replace nitrogen purging or energy intensive dehumidification systems. After fogging is complete, the openings are capped so that VCI molecules are trapped inside. These molecules are attracted to and adsorb on metal surfaces in a molecular layer that protects both ferrous and non-ferrous metal surfaces from corrosion throughout the system internals. The waterborne VCI is biodegradable and leaves a thin self-healing film that often does not need to be removed before equipment use. VCI plastic films can be used to shroud and protect equipment external surfaces with the same basic technology. It is also useful for protecting critical and operational spares or smaller parts down to nuts and bolts. 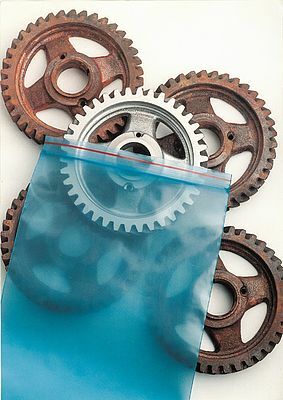 VCI molecules compounded into the polyethylene (PE) film evaporate out of the film and condense in a protective layer on metal surfaces inside the package, similar to the action of waterborne VCI in equipment internals. When the part is unwrapped, it can be easily installed without extra cleaning or degreasing required. VCI technology is relatively convenient to apply and remove for layup of large assets or basic spares and is also typically very cost-effective compared to other, more cumbersome, layup systems. In manufacturing, VCI PE film is joined by VCI coated paper to protect metals from corrosion while minimizing process steps. Rather than having to dip metal parts in a rust preventative immediately after machining and then having to clean the rust preventative off before the next stage of processing, workers can simply place in-process parts in a bin lined with VCI paper or film and allow the vapors to perform their corrosion inhibiting action. 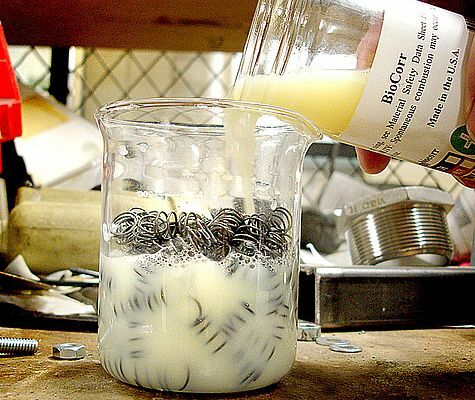 The same materials can be used to package parts for shipment so that the customers receive finished goods in like new condition without having to clean off rust preventatives (saving labor time) and dispose them as hazardous waste (saving disposal costs). Many VCI films and papers are recyclable. In some situations, a rust preventative is still the preferred method of protection. However, thanks to environmentally- and user-friendly innovation, water-based and biobased alternatives to hazardous petroleum-based rust preventatives are now a viable option. Developed by environmentally-conscious Cortec Corporation, VpCI-377 leaves behind a very thin unnoticeable dry film that can in many cases be left on the metal or painted over. For added sustainability Cortec’s BioCorr rust preventative contains 64% USDA certified biobased content. This replacement of hazardous mineral oils with renewable raw materials eliminates expensive disposal costs and reduces the use of non-renewables. Parts dipped in BioCorr are protected with a very thin dry film that can be easily rinsed off with water. In addition to developing viable alternatives to hazardous petroleum based rust preventatives, Cortec has also found ways to make its own processes more environmentally friendly. Reprocessing programs at its two VCI film plants (one in the US, one in Croatia) reduce waste by reprocessing and incorporating VCI film scrap back into virgin film at up to 20% to maintain quality requirements. Cortec has also launched a program to accept back its used VCI film from customers and incorporate it into new film. In addition to being environmentally responsible, customers receive a company credit for participating in the program. Corrosion protection is a rational aspect of conserving energy, time, and physical resources. VCI technology along with renewable, water-based, and recyclable materials minimize hazardous waste while maximizing the ease and efficiency of protecting assets.